From October 14-17, Failed Architecture and System D Academy hosted a workshop researching the history, problems and potential of Amsterdam’s ring road and its surroundings. From October 14-17, Failed Architecture and System D Academy (a two-year Master’s programme at the Sandberg Institute) hosted a workshop diving into the history, problems and potentials of Amsterdam’s ring road, the A10 and its immediate surroundings. The workshop simultaneously was a lead-up to Amsterdam’s Week of the City. On Saturday, November 8 at 17:00h, the results are presented and discussed. This gathering is part of the Week of the City programme. 17:45h Presentation by workshop participants on individual projects and thoughts on Amsterdam’s ring road A10. Location: Old School (second floor: Inbo presentation room at the end of the hallway with a view on the Ring), Gaasterlandstraat 3-5, Amsterdam. 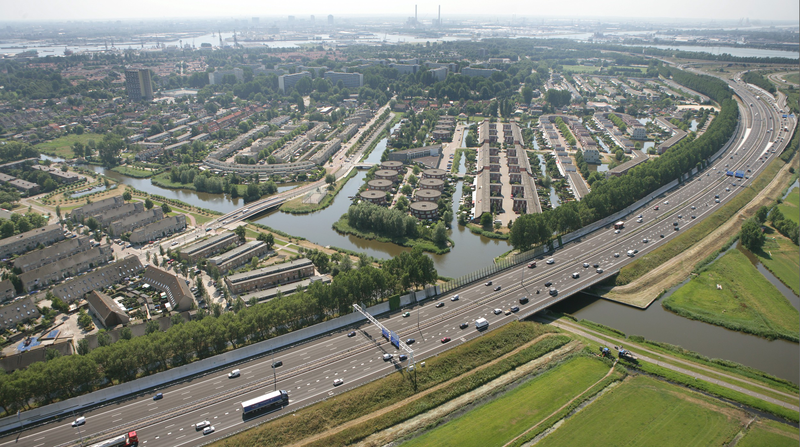 Amsterdam’s ring road started to take shape in the early 1960s but didn’t become a complete orbital route until 1990. Previously neglected and undervalued, the zone along both sides of the ring road is currently developing into a unique part of the city, one of endless biotopes, allowing for experiment and new initiatives. Now that Amsterdam’s central areas are becoming saturated and more expensive, the greyfields of vacant offices are being filled up, new housing is built and other activities are finding a home along the A10. Over the past decades, the term ‘beyond the ring’ has become commonplace, indicating urban areas on the outer side of the ring road. Often there is a stigma, the stigma of the peripheral, attached to this designation. While clear contrasts in demographics, amenities, aesthetics, economies and other variables exist between areas within ad beyond the ring, the ring zone itself is becoming a more popular destination, potentially stitching the (be it actual or perceived) disconnection between Amsterdam’s go-to and no-go areas. How did the ring road come into existence, to what extent is it an obstacle in the city’s spatial, social and economic development and what is the potential of the ring zone? These and other issues have been explored. 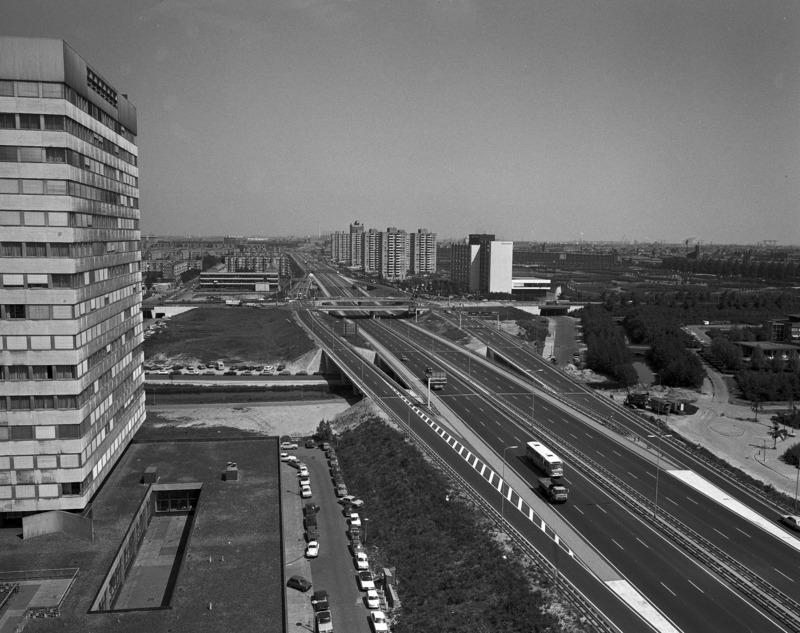 The western and oldest part of Amsterdam’s ring road, viewed from south to north, shortly after its realisation in the 1960s. Today, this section cuts through some of the densest urban fabric of the ring zone. System D and Failed Architecture both engage in cross-disciplinary explorative research, looking into the shadow side of the world that is presented to us, into the backend of urban phenomena, deconstructing their dynamics and histories. The four-day research workshop focused on the life path, problems and potentials of Amsterdam’s ring road and its fringes. The workshop consisted of a historical research, reconstructing the development of the ring zone on a wall-sized timeline, focusing on the social, architectural, political, reputational and economic forces that shaped its existence. Next to that, and in order to get an off the grid feel of the area, the workshop kicked off with a safari through Amsterdam’s rings. Moreover, the workshop fed into Amsterdam’s Week van de Stad (Week of the City), a one-week annual urban festival taking November 5-9 and is this year themed around Amsterdam’s ring road. The findings will be presented there and underpin the Week substantively. Week van de Stad is an initiative by Stad-Forum, a platform for urban dialogue in Amsterdam. 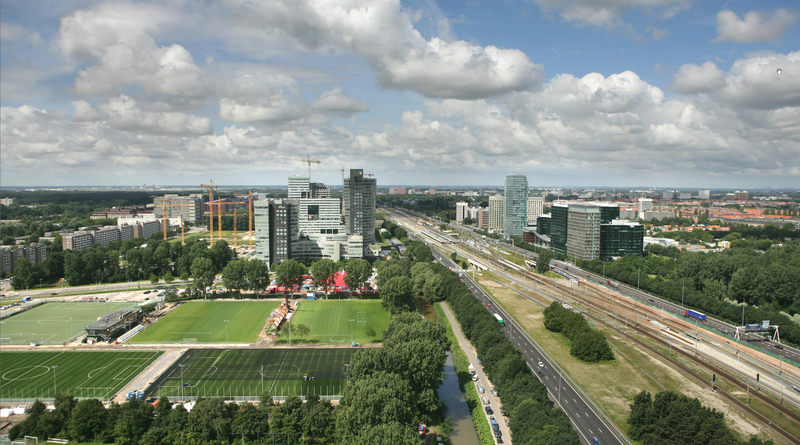 The southern part of the A10, ‘Zuidas’, viewed from east to west, which is designated to become Amsterdam’s most prominent business district. The workshop headquarters were be Old School, hosted by architectural office Inbo, situated next to Amsterdam RAI, right at the A10. The northern edge of the A10, viewed from north-east to south-west, where the ring road divides the urban and the rural.